Jesper Mattson Cruus of Edeby’s father, Matt Larsson Cruus of Hafvila, took one of the 4 farms which comprise contemporary Sätuna. He received another of the farms in 1613 as fief of Gustavus Adolphus. When his father died, he inherited that farm and purchased the rest to become the sole owner of Sätuna entire. In 1641, Jesper’s widow, Brita de la Gardie commenced construction of the stately castle/manor consisting of 3 floors as depicted in Erik Dahlberg’s ‘Svecia Antiqua et Hodierna’. In the 1700’s the castle caught fire and was virtually uninhabitable in the early 1700’s. In 1737, the widow’s heirs sold the property to Otto Fleming (1696-1778), nephew of Klas Fleming (1649-1685), who was married to Gustav Kruus’ sister, Anna Kruus. Otto demolished the old castle in 1748 and instructed Carl Harleman to design the new main building that was completed in 1752. 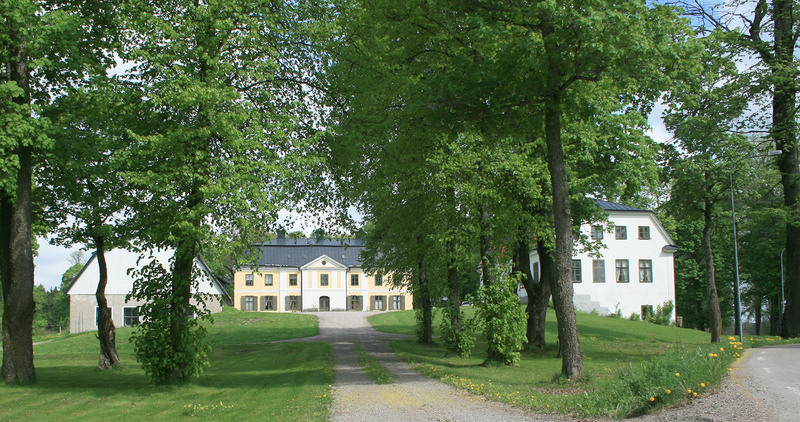 In 1784 Sätuna passed to Otto Fleming’s heirs, including Ottiliana Charlotta Fleming (married Wrede) and Anna Christina Fleming (wife of Count Nils Bonde of Björnö) In 1813 the farm was inherited by Casper Wrede and his brother Karl-Henrik Wrede. Casper undertook drainage attempts of Långsjön in 1813 and in 1814 the same for Mjölängssjön. On March 24th, 1815, the property shifted between the brothers with Casper receiving the manor and Karl-Henrik taking possession of Fasma with it’s subordinate farms. March 22nd, 1816 Casper Wrede sold Sätuna manor to mill owner Bengt Magnus Björkman (1745-1824) who was one of Sweden’s wealthiest men at the time. He immediately leased Sätuna to his nephew Ernst Fredrik von Willebrand and daughter Ulrika von Willebrand. In 1821 von Willebrand went bankrupt and the marriage dissolved. Since the owner, Bengt Magnus Björkman died in 1824, Sätuna was taken over by his youngest son, Johan Fredrik Björkman. In 1836, Johan Fredrik (nicknamed Fritz) moved to the farm and began attending to it seriously. His passed away in 1891. His widow, Ebba Gustafav Björkman (called ‘her grace’) formed the Corporation ‘Sätuna Ltd.’ with her children which was highly unusual at the time. Through intermarriage Björkman and Loven are now the principal owners of Sätuna.